Manoj Godara, Chandigarh, September 28: Professor R.C. 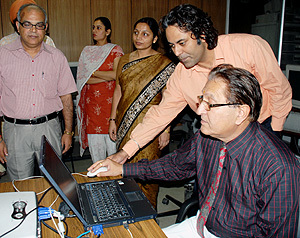 Sobti, Vice-Chancellor, Panjab University launched a new website ‘www.puchd.ac.in’ of the University with advanced technology in the department of Computer Science and Applications on the University Campus here today. The new website of the University is a dynamic website. The information displayed on web pages comes from database. The University’s new website consists of more than 150 websites of different departments and facilities. All the departmental websites have now similar look and feel. The information relevant to a particular department available at main site could also be viewed at their respective departmental sites. The information if has its relevance to two or more departments, will simultaneously be available to the respective departments through the database. Ms Mamta and their team for website development, he added that the website had been fully conceptualized, developed and hosted at computer center, DCSA. Prior to inaugurating the launch of the Website, the Vice-Chancellor extended the facility of the National Knowledge Network (NKN) provided by the Ministry of Human Resource Development to the University staff and students. In his presentation,Dr Tankeshwar Kumar, Director, Computer Centre said that National Knowledge Network is scalable and expandable network in which all the Universities including IITs, IISc shall be connected through a high speed bandwidth extendable up to 10 GBPS. Besides, the students and staff will be highly benefited as they could set up countrywide real time class rooms, Grid Computing applications and shall be able to collaborate with the other networks in other countries for experiments like LHC and ALICE. Dr Anu Gupta, Chairperson welcomed the Vice-chancellor to the Department and thanked him for the encouragement provided to the members of the departments. Mr Ajay Guleria, System Manager for getting setting up the National Knowledge Network.